part 6 of the Captain A-Hole Revenge. Not another person. This is really getting stale fast. Hello sir, Im a Jehovah witness here preaching the word of God. Sure right, I got something for you Mr. Witness. What are you going to do with that. Beating with it of course. Hello is this EvilGuy, Just want to say I defeated you Jehovah witness and you next. 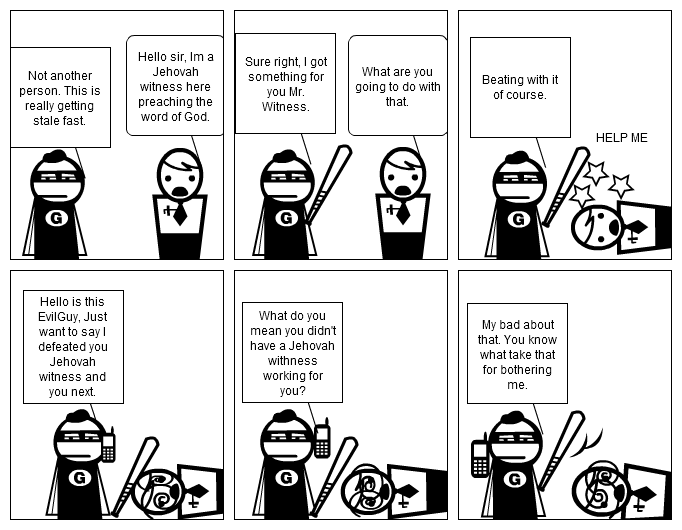 What do you mean you didn't have a Jehovah withness working for you? My bad about that. You know what take that for bothering me.